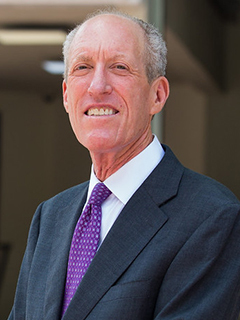 Edward Abraham, MD, serves as the chief academic officer for the Miller School of Medicine and physician executive of the University of Miami Medical Group. He plays a leading role in the advancement of education, research, and patient care, but also helps steer our medical enterprise through the rapid and profound changes reshaping health care delivery. Dr. Abraham is an internationally renowned pulmonary medicine and critical care physician and an accomplished scientist who has received extensive NIH funding for more than 25 years. As an administrator, he has a proven record of accomplishment, breaking down silos and building teams, coupled with a savvy business acumen and thoughtful decision-making. Over the last six years at Wake Forest, Dr. Abraham has overseen the academic enterprise and led a number of key initiatives, which include development of a new faculty compensation plan and a strategic vision for research in the School of Medicine. He also opened a new medical education facility and built a powerhouse of clinical and basic science chairs, senior associate deans, and center directors. At the Miller School, he will have significant input on the business of medicine, bringing his keen sensibility and experience to our practice plan. He joined Wake Forest from the University of Alabama at Birmingham, where he was chair of the Department of Medicine. During his 5 1/2 years at UAB, the Department of Medicine increased research funding by 25 percent and initiated many innovative programs enhancing diversity, mentoring, and collaboration. Before moving to UAB, he spent 13 years at the University of Colorado Health Sciences Center, where he was head of the Division of Pulmonary Sciences and Critical Care Medicine and Vice Chair of the Department of Medicine. Dr. Abraham received undergraduate and medical degrees from Stanford University and trained in internal and critical care medicine at the University of California, Los Angeles. His first faculty appointment was at UCLA, where he held a number of leadership roles in pulmonary and critical care medicine. He has published more than 350 original research articles, reviews, editorials, and book chapters. Dr. Abraham’s research has focused on inflammation, neutrophil biology, acute lung injury, and sepsis.